Run this GDPR checklist to implement GDPR adherence in your organization or team using ICO recommended approaches. 9 Review how you seek, record, and manage consent. This GDPR checklist for businesses is built on the basis of official ICO guidelines and recommendations. 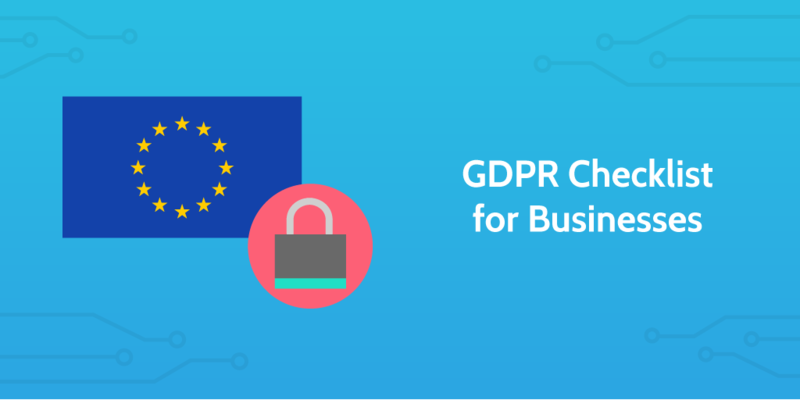 Using this checklist will help you structure your business to adhere to the GDPR. It is important to note, however, that an independent consultant should be sought to assist your compliance and you shouldn't rely solely on this checklist. For many large companies, you won’t have to run this checklist only once, but many times. Different teams or wings of the company will need to analyze their activities for non-compliant structures or processes. All data entered into the form fields throughout the checklist will be saved in the template overview tab so that the appointed Data Protection Officer can monitor the responses and information from each team. This is designed to help large companies create a system of oversight quickly and easily. Watch the video below for an introduction to GDPR or read our accompanying article: How to Be GDPR Compliant: A Guide for SaaS and Beyond. Use this section to record the details of who is completing the checklist and why. You can edit this section to include form fields specific to your business. It is important to make sure other members of your team or organization are aware of GDPR and its potential ramifications. Stressing the importance of these changes to data regulations will help to encourage compliance throughout the team or organization. You could call a meeting to present the risks of GDPR and the steps needed to ensure compliance or you could use the email widget below to notify people within the team or organization that the process of adhering to the GDPR is beginning. Use the form field below to document the steps you took to provide awareness throughout the company. It is important to make sure all activities related to data are well documented. Documenting this information places you in line with the GDPR's accountability principle. Use the form fields below to briefly summarize each of these concerns. Why is that data held? The GDPR requires certain changes to privacy notices and these should be reviewed alongside your existing practices. The privacy notices codes of practice can be found here: Privacy Notices, Transparency and Control. When you collect data you normally inform the subject who you are and how you intend to use the data. This is common practice. Explain the individual's rights in regards to the complaints process to the ICO. The GDPR states that this information must be delivered in a concise fashion with clear and easy to understand language. Use the form field below to note the specific changes you need to, and intend, to make. The GPDR confers a series of rights and freedoms to individuals in respect to their data. It is your responsibility to make sure your company's actions allow for the fulfillment of these rights. Devise a series of example cases and work through each scenario to understand exactly how the company will respond to these requests. If you do not already have procedures which protect these rights, it is important to create those procedures. Use the form field below to link to where these documented processes can be found. You can use Process Street to document your procedures. The GDPR provides individuals greater rights in regards to accessing their data. Your company must provide appropriate means to access that data. This could be simply responding to access requests as and when they arrive, or you may consider creating a system whereby customers can access their own records. How you choose to implement this depends on the specific conditions within your company. Whenever you are processing data, your documentation for that process should make clear upon what justification it is based. Use the form field below to identify your different processing activities and which lawful justification applies to each. Review how you seek, record, and manage consent. Consent plays a big role in the GDPR and its outline should be understood by all members of the team. The Data Protection Officer and other key decision makers in regards to data security and access should read the ICO's consultation paper: GDPR Consent Guidance. Below are three checklists from the ICO to guide you through your consent management. Within the GDPR, consent is of great importance. However, not all individuals online have the capacity to give consent. You need to assess your policies to see whether you need to put systems in place to protect children who are unable to consent to the gathering or processing of their data. If your organization offers online services (‘information society services’) to children and relies on consent to collect information about them, then you may need a parent or guardian’s consent in order to process their personal data lawfully. The GDPR sets the age when a child can give their own consent to this processing at 16 (although this may be lowered to a minimum of 13 in the UK). If a child is younger then you will need to get consent from a person holding ‘parental responsibility’. You must take steps to ensure children can understand your requests for consent and that consent of a person holding parental responsibility has been granted. Use the form field below to document the changes you believe your organization will need to make. You need to make sure your procedures cover the detection, reporting, and investigating of data breaches and the risks to personal data. In the case of a breach, the company must inform the relevant regulatory body within 72 hours of finding out about it. Best practice is to inform the regulatory body as soon as is possible. The same applies to the individuals you hold data on. The company must contact any individuals to make them aware that their data has been breached if this is seen to pose a danger to their rights or freedoms. If the data has been encrypted to the point of being unintelligible. If the data controller has taken the necessary steps to make sure the breach doesn’t put rights or freedoms at risk. If it would involve a disproportionate amount of effort to inform each individual. In this scenario a public announcement would suffice. Use the form field below to link to your relevant procedures. You can use Process Street to document, manage, and run these processes. There are a series of standard assessments you should carry out to make sure you are delivering privacy by design. The GDPR refers to Privacy Impact Assessments (PIAs) as Data Protection Impact Assessments (DPIAs) and makes these DPIAs mandatory in certain circumstances. It is recommended that you read the ICO guidance document on PIAs and the guidance from the Article 29 Working Party. Use the form field below to upload your Data Protection Impact Assessment. If you haven't already appointed a Data Protection Officer, now is the time to do so. If you are running this checklist for the first time for your whole organization then you likely do not have a Data Protection Officer at this point in time. If you are running this checklist as a smaller team within a larger organization, this checklist is likely feeding data back to your Data Protection Officer already. Guidance from the Article 29 Working Party can be found here: Article 29 Working Party Overview. The specific report on Data Protection Officers can be found as a PDF hosted below. Use the form fields below, if applicable, to name your new Data Protection Officer and why they were selected. If your organization operates in more than one EU member state, it is important to identify which organization will act as your lead data protection supervisory authority. Use the form fields below to record the important information.